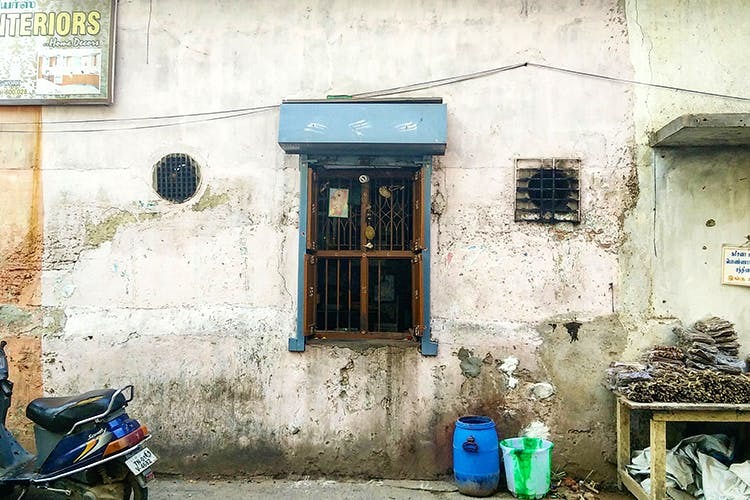 Jannal Kadai (window shop) near Kapaleeswarar Temple is an old, quite literal, hole-in-the-wall that serves some all-time favourite tea time snacks from 5.30 pm daily. And they even serve breakfast! If it weren’t for Google Maps, I probably would have never been able to find the place but ask anyone and they’d direct you to a narrow road (Ponnambala Vadhyar Street) just a street away from Kalathi Rose Milk Shop. You can hear the chants from the majestic Kapaleeshwar Temple as you wade through the crowded streets. I reach Jannal Kadai by 5.15 pm and look around to make sure I am in the right place (there’s no sign board). I expect to see a crowd near the windows, but there’s no one there yet. After speaking to someone through one of the windows I find out I am at the right place but food would be served after 15 minutes. Sure enough, by 5.30 pm the crowd started gathering. Don’t be late, because the food is served nice and hot at this time. I ordered a plate of vazhakkai bajjis. (You get three for INR 30). They were absolutely scrumptious. Even the coconut chutney that accompanied it was simply delish. Jannal Kadai is a popular spot this side of town and has been serving delicious vegetarian fare for years, so if you’re in Mylapore, do give this place a try and ask for the bajjis! The azhakkai bajjis were a little greasy but crispy and delish nonetheless. The menu is pretty limited. You get bondas, dosa, idli, molagu (chilly) bajji, (plantain) vazhakkai bajji and a couple more items but this depends on availability on a particular day. Do note that there’s obviously no seating arrangement available. So you can either stand outside the window shop and savour brekkie or evening snacks, or pack it to go.